I was born in the first half of the last century. 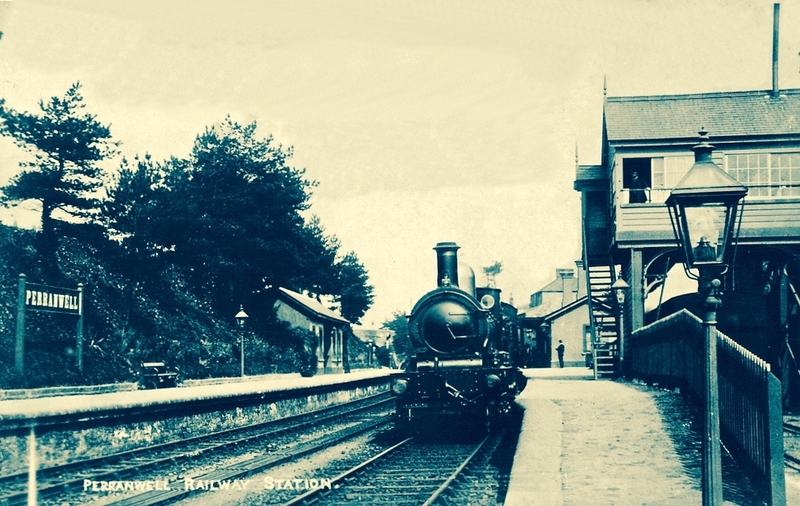 Early memories of the 1950s include the regular journeys my brother and I made as small boys on the mighty Atlantic Coast Express via Okehampton to visit, first, our sets of cousins on Dartmoor, and then beyond – via the even mightier Great Western Railway – to our cousins in the depths of Cornwall. The latter visits were particularly idyllic: the cousins (generations older than us) had a small farm and a herd of cows which they milked twice a day – by hand. Following this they cooled the milk in a big steel drum by stirring it with a propellor (we were allowed to do this) before pouring the precious liquid into bottles which were then sealed with silver caps using a rubber device which impressed on them the name ‘Cove Farm’. Then, together, we set out on bicycles to deliver the bottles to the doorsteps of every dwelling in the small village of Perran-ar-worthal. Perran-ar-Worthal (in Cornish Peran ar Wodhel) means ‘St Piran’s village by the creek’. Who is St Piran? 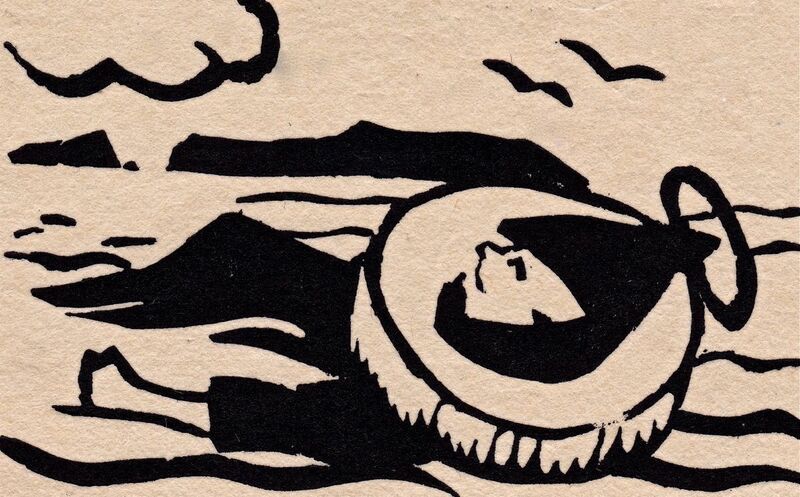 He is the Patron Saint of Cornwall and we’ve met him before, briefly, in my account of St Ciarán, who was born on Cape Clear, and was known as ‘The First Saint of Ireland’. Even before St Patrick arrived to start his missionary work in 432 AD, St Ciarán (according to some records born in 352 AD) had been at work converting the ‘heathen Irish’. Unfortunately, his efforts were not always appreciated and Ciarán was despatched from the top of a tall cliff with a millstone tied around his neck! 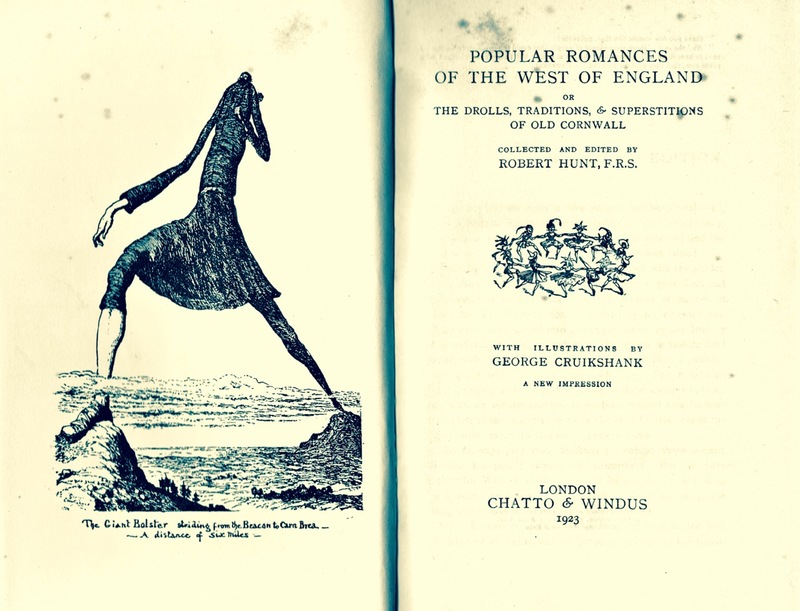 The story is elaborated by Robert Hunt FRS in his Popular Romances of the West of England first published in 1908. I have the third, 1923 edition on my bookshelves. To complement that little story of the saint in Cornwall, we have to visit Ossory, an Irish diocese which encompasses parts of Kilkenny, Laois and Offaly. 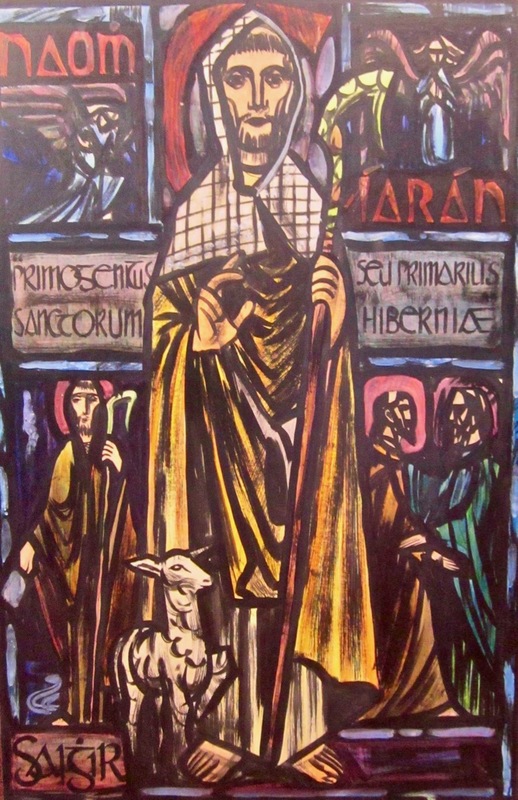 There they also celebrate St Ciarán of Saigir on March the fifth: he is said to have returned from Rome after years of study, firstly visiting his native Cape Clear, then commencing his travels through Ireland until his bell rang of its own accord – this happened at a small hamlet in County Offaly, now known as Seir Kieran. There he set up a foundation, the remains of which are still visible – as is a holy well, a holy bush (bedecked with clouties) the base of a round tower, the base of an ancient high cross (now holding water which has curative powers) and a holy rock which was once said to have displayed the hand print and knee prints of the saint, now completely obscured. One of my favourite stories about St Piran tells of how he discovered tin smelting. He used as his hearth a piece of local stone; when he lit a fire on the hearth the veins of tin ore in the stone melted and a stream of silver ran out across the black rock, in the form of a cross. From that day to this the flag of Cornwall is a white cross on a black background, and Piran is the patron saint of tin and tinners. Just about now in Cornwall a great celebration is going on in honour of the saint. There will be a procession to the original oratory buried in the sands, led by the Grand Bard of the Cornish Gorsedd. Cornish flags – and the Cornish tartan – will be very much in evidence. The Cornish people have a great nationalistic spirit and have called for the 5th March to be an official public holiday. 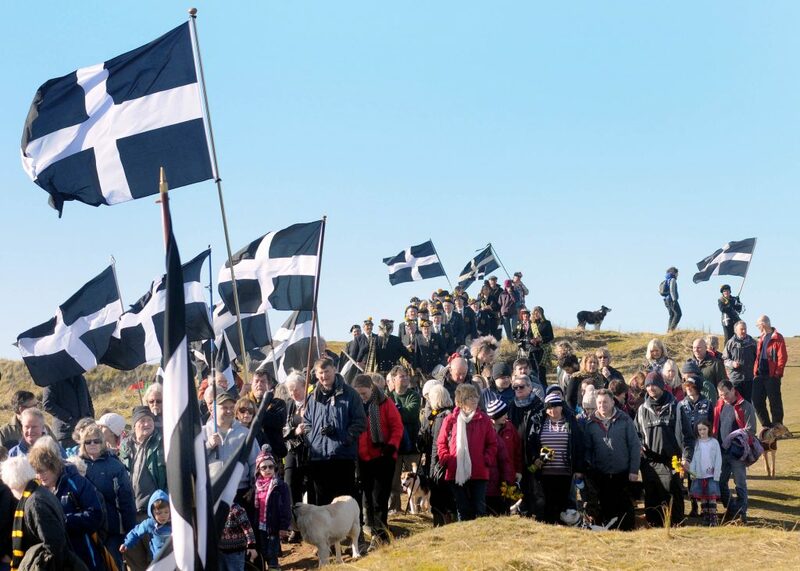 In a recent debate on Cornwall some interesting views were expressed on the place of Cornwall in a post-Brexit world, and the attributes of St Piran were symbolic of this – his inventiveness, his love of nature, and his belief in the inclusivity of all peoples in an international community. St Piran lived to a great age. They say in Cornwall that he was ‘fond of the drink’ and met his end by falling into a well when walking home from a party. I hope it was a holy well! 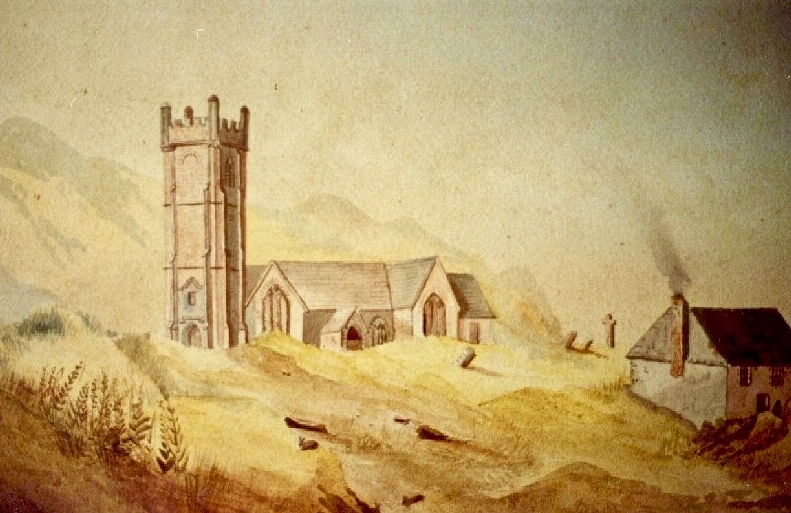 Today, seventeen centuries after St Ciarán / Piran was thrown from the cliffs of Cape Clear I am looking out to that island: …the winds are blowing tempestuously, the heavens are dark with clouds, and the waves are white with crested foam… There have been so many links between Cornwall and West Cork, ever since the Bronze Age, when Cornish tin traders brought their metal to mix with copper mined above us here on Mount Gabriel. 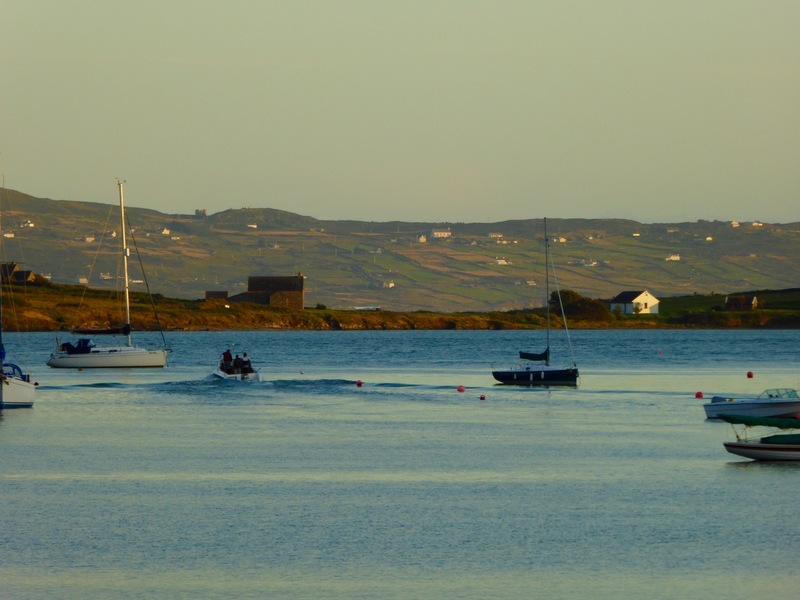 Watch out for more posts about these links, and mark your diaries for an exhibition coming up in June in Uillinn, West Cork’s fine new gallery, of the work of artists from Cornwall. This will be followed next year by an exhibition in a Cornish gallery of the work of artists from West Cork. West meets West will forge new and lasting links between the two communities: links which would have warmed the heart of our shared saint!